GoodReads Summary: A coming-of-age tale with a spooky twist! What Jen Thinks: After Teachers Write this past summer, I have an entirely different outlook on writing. I've always felt that my high school writing workshop experiences gave me a great basis for creative writing but I've gotten out of the mode of writing fiction since going to college and writing academic papers and now non-fiction pieces as I blog. Teachers Write reminded me how much a writer needs to know his or her characters inside and out. At NCTE, I heard Lindsey Leavitt speak and she talked about creating a Facebook or a Pinterest page for characters. I love that idea. One of my favorite brainstorming activities is to think about what you might find in your character's closet. I read Friends with Boys before hearing Lindsey at NCTE, but thinking back on this book, I can totally see how I would be able to build a Facebook page or a Pinterest board for Maggie, her brothers, and her two new friends. 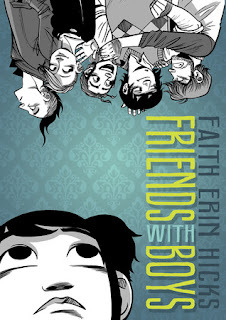 Faith has done an amazing job of helping readers know the characters in this book so that we really could know them well. Besides showing us who her characters are, there is also the element of what came before this book. I love that there is history between her new friend and one of her brothers. Isn't that kind of how it works in high school? Most of the kids in high school are kids you've known since or at some other point in your school career. It's so interesting how we make new friends and keep some old friends or how friends become acquaintances and vice versa. I love how Erin builds tension with this part of the storyline. I think lots of people want more to this story...I know I did! That was the first thing I asked when I met Faith at NCTE. I was sure she was working on a sequel but she said she isn't and it didn't seem like she plans to. Friends with Boys might just be every English teacher's dream. It's a book that just begs for fan fiction to be written. It begs for readers to break out their pens, pencils, charcoal, whatever and tell more of Maggie's story and to resolve the ghost's story. I don't think it should be an assignment, but when Erin told me she's not going to work on a sequel and that that's what fan fiction is for...it got me thinking! I've never wanted to write fan fiction before but the wheels definitely started turning in my head. I think readers will enjoy unraveling the story in the book and then, just maybe, letting their imaginations decide what happens after the book ends! What Kellee Thinks: Friends with Boys is a book that seems like a normal realistic fiction novel about a girl starting high school. Maggie has always been homeschooled by her mom, but she is now in 9th grade (and her mom left), so it is time to go to high school. Will Maggie be able to fit in? Wait... then all of a sudden there is a ghost. At first it didn't seem to fit into the story, but then the story began to unfold around it. With her new friends it is up to her to figure out the mystery behind the ghost. This book is really about finding the truth- the truth in yourself, your family, your friends and the past. I really adored the characters in this book- I'd want to be friends with Lucy and Maggie and her brothers are the type of older brothers all girls dream of. 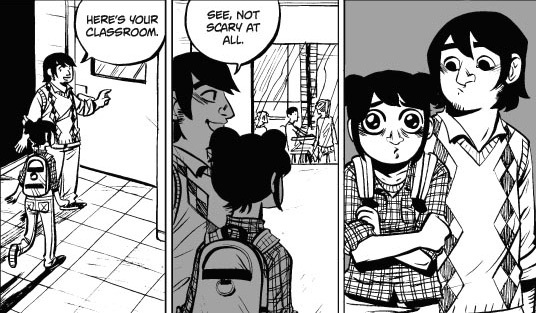 The story also deals with bullying and making choices in high school which I thought was a nice touch. And the art was great as well! Thick lined, realistic, easy to interpret- overall enjoyable. I will say, though, the story, at times, very much reminded me of Anya's Ghost, but that isn't a bad thing at all. Writing Prompts: Write about a time in your life when something that was out of your control changed drastically in your life without warning. How did it feel? How did you handle/cope with the situation?